Dates famously know as Khajur in India. Date palm tree is generally found in desert and is one of the older fruits bearing tree on earth. Dates barfi made from fresh Dates and dry fruits and it is considered to be very nutritious fruit. The sweetness and richness of dry fruits makes it a perfectly nutritious and healthy dessert. Dates are rich in natural sugar, protein, iron, calcium, several vitamins and dietary fibre. 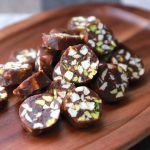 With all these healthy ingredients and in very minimal time, you can easily make this mouth watering and healthy Dates barfi or khajoor barfi, and enjoy it in navratri or any other festivals. It is believed that Dates are originated in middle east, and now famous in all over the world for its sweet taste and health benefits. Dates or Khajoor reminds me of very famous proverb in Hindi “Aasaman se Gira, Khajoor pe atka” (falls from sky and stuck on Dates tree) – the meaning is – you are coming out from one problem but gets caught in another. I have lots of stories to tell in which I can literally fit this proverb and now those are my sweet memories to laugh out loud at times. In Muslim community, Dates are highly recognised fruit, it is a symbol of power, wealth and abundance. It is considered as a holy fruit as during Ramadan month, people eats dates to open their fast – Rosa. 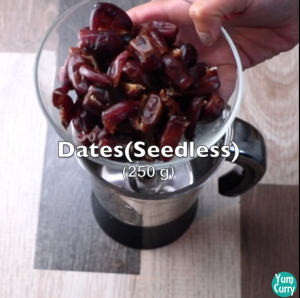 it is recommended to start iftar and break all day long fast by consuming dates, dates are high in glucose and other minerals, that helps to restore blood sugar level and having 5-6 dates a day fulfil your daily food intake requirement, it gives instant energy and keep them energetic for whole day during fast. Although there are many other reasons that are related to culture. There are many kinds of dates available in the market. They all are different in size, colour, shape and wrinkles on the skin. some dates are very expensive because its take long process to prepare them, they need particular climate to grow. 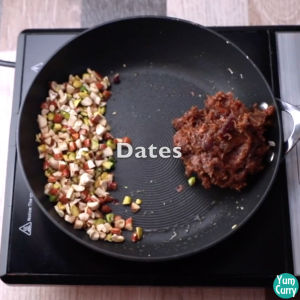 We can enjoy dates in all 3 stages – dates fruit, ripped dates and dry dates. In India, dry dates are used as dry fruits and we include them in lots of sweet preparations in place of sugar. 1. Dates are high in potassium, helps to keep our heart healthy. 2. Dates make our immune system strong. 3. You can have dates with a glass of milk, this can help to gain weight. 4. Dates barfi are high in vitamin B, good for skin and hairs. 5. Because they are low in fat , they helps in controlling cholesterol. 6. it also contains calcium and makes bones stronger. 7. Fresh dates are soft and high in fibre so it prevents constipation. 8. High iron content maintains Hemoglobin. 9. High in protein and antioxidants. Dates are considered to be very good for pregnant ladies. Constipation and low energy are very common problem during pregnancy due to the hormonal changes, since dates are very high in fibre and glucose content so it will be very helpful. Dates also contains folate which is very important for development of brain and spinal cord of baby. Some studies shows consumption of dates in moderate amounts during late pregnancy aids in uterus contraction and shorten the labor time. 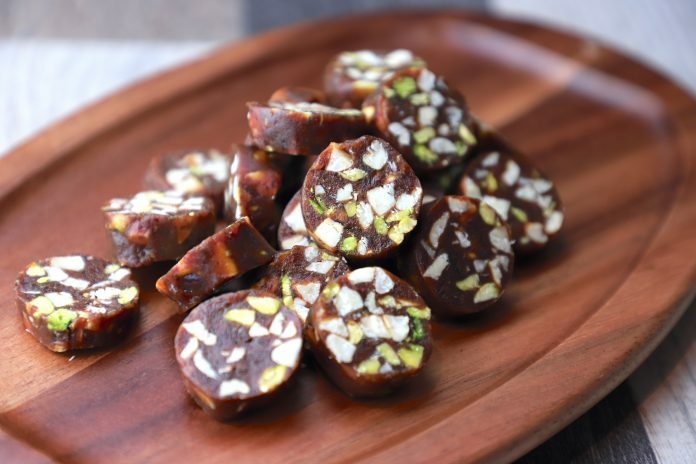 So if you are meeting with any pregnant lady who could be you friend or family, what else can be best thing to give them homemade dates or khajoor barfi. I have also made some more recipes for vrat or fast specially for Navratri in my navratri recipe collection which includes recipes such as coconut barfi, milk peda for dessert. And singhara pakora, kuttu paratha, falahari chaat, sabudana khichadi and sabudana vada for savoury food. 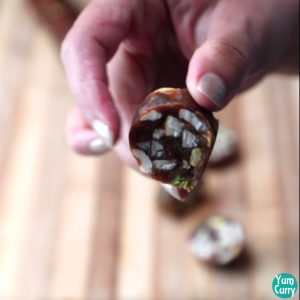 Softness of dates varies from dates to dates, if you are using dates which are extra juicy or soft give them extra time to set or cover dates barfi roll in butter paper or aluminium foil, so when you cut pieces its come out perfectly round in shape. Dates have very strong flavour, so i am not using cardamom, if you like you can add. No need to add any sugar, because date’s sweetness is enough to make it sweet. To make it more presentable you can roll the mixture on to roasted poppy seeds, normally we find this presentation in sweet shops. 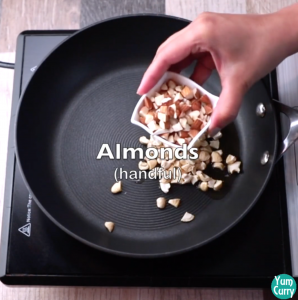 You can add any other nuts of you choice to adjust the quantity according to you choice. As khajoor is warm in nature, high in sugar it is advised to take it in moderate quantity. Place barfi in airtight jar and store in fridge for 3-4 month. Cut dates into small pieces. I am using seed less dates, if you can't find seedless khajoor, you can buy with seeds and remove seeds at home. 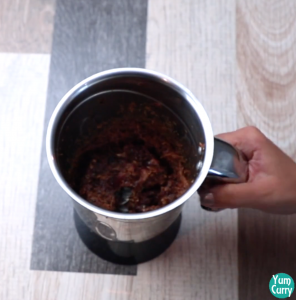 Now grind khajur or dates pieces in a blender, do not make it very smooth paste. Keep it aside. 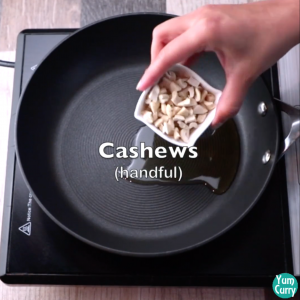 Heat a Pan on medium heat, add ghee(clarified butter), now fry cashews, almonds and pistachios until they turn golden brown. 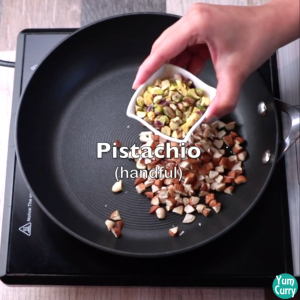 Now transfer almonds, cashews and pistachios to the side of pan and add ground dates to the centre of the pan, use spatula to mash it a little and let it cook for 5 min. Mix all ingredient well, when they all comes together and becomes like a dough, turn off the heat, as dates are sticky it is easy to bind the mixture. Now take out mixture on to the greased platform, and let it cool down a bit, don't leave it for longer time else it will turn hard. Grease your hand with ghee and start rolling the khajur barfi mixture into cylindrical shape. 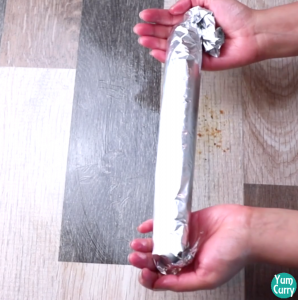 Cover the roll with aluminium foil, completely and refrigerate this roll for 1-2 hrs. Take it out from fridge and remove the aluminium foil. Start cutting 1/2 cm thick round pieces from the roll. 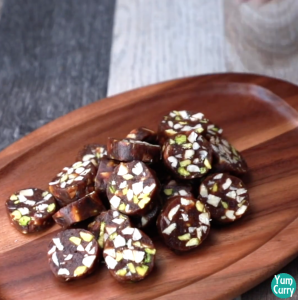 Healthy nutritious dates barfi is ready to serve, keep pieces into an airtight container and store it in the fridge. Remove seeds from dates and cut into small pieces.there are huge varieties of dates available in the market, soft dates are good for barfi. Add dates pieces to grinder and grind it into fine pieces, keep it aside. 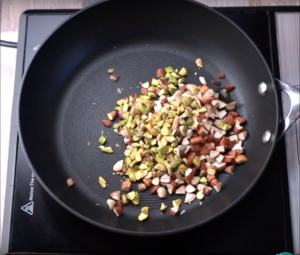 Heat a pan on medium heat, add ghee, Cashews, almonds and pistachio. You can add any other nuts of your choice and also the adjust quantity according to your taste. Fry cashews, almonds and pistachio until they turn golden brown. 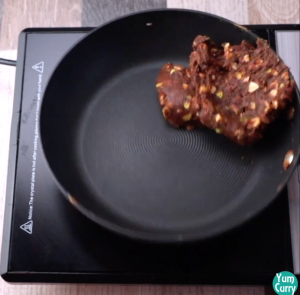 Transfer the dry fruits on to the side of the pan and add khajur paste to the pan. Dates will start melting in some time. Cook for five minutes, mix all ingredient well, let them come together. 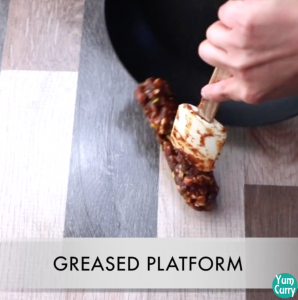 Turn off the heat, takeout mixture on to a greased platform or big plate. Don’t touch hot mixture it can burn your hand. Let it cool for some time. 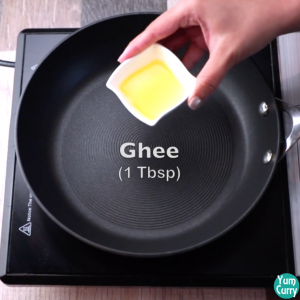 Apply some ghee to your palm and platform because barfi mixture is little sticky so it is easy to handle with greasy hands. Start rolling the mixture in to a cylindrical shape. 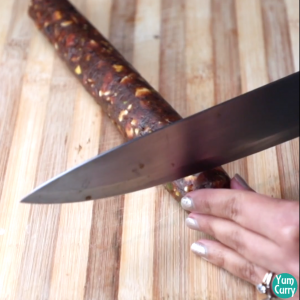 Cover the smoothen roll completely with aluminium foil. Now keep the roll in to the fridge for 1-2 hrs and allowed it to set properly. When its completely set, take out from the fridge and cut it into 1/2 cm thick round pieces. Delicious and healthy khajoor barfi is ready to serve.enjoy whenever you have sweet craving without any tension. Store barfi in airtight jar and keep in fridge.